Following on from customer feedback to the parking facilities at Heart of the Shires, we have invested into a brand new driveway and parking area. We now have a new entrance, driveway and parking bays, completing a full refurbishment that began in 2016. Following resurfacing work that took place during September, we’ve now concluded the final stage of the site’s development. The 6,000 square metre resurfacing project was carried out by Phoenix Surfacing, an independent surface contractor based in Kettering. The resurfacing completes the £100,000 plus site refurbishment and updates that began in 2015 when our site colours were altered and a new logo and signage were designed. The modernisation at our grounds have been kept in a style which still reflects the surrounding area and the age of the Victorian red brick buildings. During the redevelopment, it was decided early on not to spoil the character of the Victorian site. “We’re very proud of our site’s history and we are always keen to make improvements whilst keeping the original quirks and charm of the buildings.” explains Gail. Contractors Phoenix Surfacing work involved the preparation of an existing stone car park with the surfacing element of the work thoughtfully programmed over a series of days and nights. This helped avoid disruption to businesses and their customers. The line marking of the bays was phased to allow sections of the car park to be opened at all times. 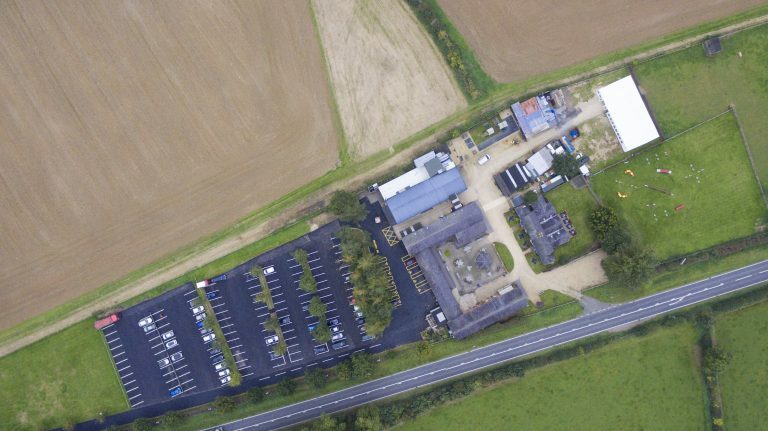 Having had numerous compliments from customers of the shopping village too, Phoenix Surfacing commissioned aerial portraits using drone technology to showcase the finished article. ← Merry Christmas & a Happy New Year from all at Heart of the Shires!